New Delhi. The Travancore Devasam Board, which manages the Sabarimala temple, has withdrawn from its decision. He has said that while respecting the order of the Supreme Court, women of all ages will be allowed to enter the temple. In this case 64 judgments have been filed in the Supreme Court, including 54 reconsideration petitions. On Wednesday, the Chief Justice-led Constitution Bench heard it. On September 28, the Supreme Court ordered the 800-year-old tradition to be over. 64 applications were filed in the Supreme Court, including 54 reconsideration petitions. One of the petitioners, Nayar Service Society (NSS) lawyer Parasaran told the court that the tradition of Sabarimala can not be kept equal to the untouchable, it is just a religious ritual. The petitioners demand that the Supreme Court reconsider its decision. On the other hand, the Kerala government opposed the reconsideration of the decision. His lawyer, Jaideep Gupta, told the court that there has been no such facts in front of you that prove the rethink as justified. In this matter, the Constitution bench, which considers the decision, in addition to Chief Justice, Justice RF Nariman, AM Khanvilkar, DC Chandrachud and Indu Malhotra are included. Former attorney general and senior lawyer Parasaran opposed the court's September 28 decision. He said, "Article 15 of the Constitution says that the doors of all secular institutions of the country should be opened to all, but it is not for religious institutions." The Supreme Court had on September 28 ordered a four-year decision to abolish the 800-year-old tradition of entry of women from the age group of 10 to 50 years at Lord Ayyappa Temple in Sabarimala. This decision was given by the Bench of five judges, headed by then Chief Justice Deepak Mishra. After the court verdict, Kanakdurga (39) had broken the 800-year-old tradition by sighting God Ayyappa on January 2 with the female partner point (40). Both had worshiped the temple in the temple. After this, the performance in the entire state had flared up. He was the first woman to enter after the Supreme Court order. 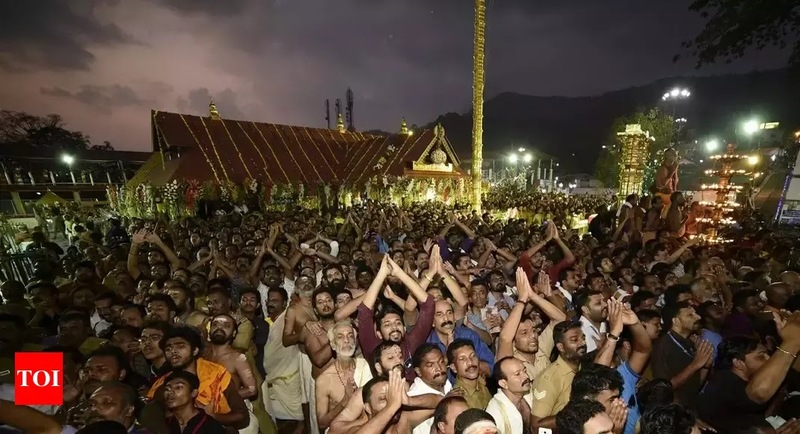 NEW DELHI: Sabarimala Devasam Board has approved the Supreme Court decision to allow women of all ages as a sudden turning point in the Sabarimala temple affair. In September last year, the Supreme Court ruled that women of all ages in Sabarimala could go to darshan. 60 people have filed appeals to the Supreme Court to change the verdict. These petitions are being investigated. Everyone is entitled to enter Sabarimala temple. The Supreme Court has surprised the Supreme Court, saying that the Board of Trust had made the decision to change the decision on equality. The Devasam Board, which demanded a deadline to implement the judgment last November, has now changed the position. Despite all the objections, 42-year-old Kanaka Durga and 44-year-old Bindu Ammini went into the temple and worshiped Sami. Until today, the right-wing organization has been protesting. The Travancore Dewasan Board, which manages the Sabarimala temple, has been reversed by its old stand in the Supreme Court on the issue of entry in the temple to women of all ages. The Board has said in the Supreme Court that now it is not against the admission of women of every age in the sanctum sanctorum of the temple. In fact, many parties have filed a rethink petition against the Supreme Court's decision on which the court had sought the opinion of the Devasana Board during the hearing. A Padmakumar, chairman of Travancore Dewasan Board, said that on the basis of the Supreme Court verdict on September 28, 2018, the Board has decided that he will not file a reconsideration petition against the decision of this court. He said that the Dewasan Board accepts the Supreme Court decision and it is our view that there should be no discrimination. He said that earlier, the affidavit filed by the Devasana Board in the court had followed the decision of the apex court. We had already said that the board will accept the decision, so we have given this information to the court. Padmakumar said that the board does not decide its stand in the influence of the government. After listening to all the parties, if the court holds a separate opinion from its old judgment, then the Board is bound to accept that decision too. Padmakumar asked if BJP first welcomed the decision of the Supreme Court, it was declared a historic decision in their mouthpiece. Now, in whose pressure did they turn away from their stand? Let us know that against the verdict of the apex court, there was a big movement under the leadership of Bharatiya Janata Party (BJP) in Kerala. On the other hand, the LDF government of Kerala also took legal action against several agitators for implementing this decision. Commenting on the action of the Kerala government, Prime Minister Narendra Modi had said in his public meeting that the conduct of the LDF government will be known as one of the most embarrassing behavior in history. PM Modi had said that if any one party stands to protect Kerala and its culture, then it is the Bharatiya Janata Party. He had said that his stand on Sabarimala issue has always been clear and the action of our party matches our words. Let us tell you that in September, 2018, the Supreme Court had allowed women of all ages to enter Sabrimala temple in their decision. Earlier, entry of women from the age group of 10 years to 50 years was prohibited in the temple. Performing and closing of Hindus' organizations in whole of Kerala against this decision of the court. After the court's decision, only two women of the restricted age group have been able to enter the temple and have seen Lord Ayyappa. Various organizations have filed a reconsideration petition against the Supreme Court verdict. On which the Supreme Court completed the hearing on Wednesday and reserved its decision on all reconsideration petitions.